Entdeckt die schönsten Ecken auf Neuseelands Südinsel auf dieser Rundreise: Ihr könnt bei Kaikoura Wale beobachten und unternehmt einen Abstecher in den traumhaften Abel Tasman Nationalpark, bekannt für seinen paradiesischen weißen Strände. Zahlreiche Abenteuer-Aktivitäten, die euer Adrenalin in die Höhe treiben, erwarten euch in Queenstown. Ihr erkundet den atemberaubenden Milford Sound und werdet aktiv bei einer Radtour entlang des Otago Rail Trail. Die bizarren Pancake Rocks im Paparoa Nationalpark werden euch ebenso begeistern wie der Besuch bei der Cape Foulwind Robbenkolonie und das charmante Christchurch. Fahrt mit der Fähre zur Südinsel. Von Picton reisen wir zum Abel Tasman Nationalpark. Wandere und erkunde die goldenen Strände und Wasserwege des Küstenparadieses. Es geht nach Süden zu den Küsten mit den schwarzen Sandstränden. Besuche die Robbenkolonie am Cape Foulwind. Übernachtung in einer Lodge umgeben vom Regenwald. Entdecke die Umgebung dieses UNESCO Weltnaturerbes. Freier Tag für optionale Aktivitäten, wie Wanderungen, Reiten oder Quadbike-Fahren. Die Abenteuerhauptstadt Neuseelands erwartet uns. Zeit zur freien Verfügung für actiongeladene Aktivitäten, wie Jetboot fahren, Bungee-Springen, Mountainbiken oder Fallschirmspringen. Erlebe die atemberaubende Landschaft von Fiordland am unberührten Milford Sound. Wir besuchen optional eine Höhle, in der Glühwürmchen ihr Zuhause haben. Weiterfahrt nach Central Otago, bekannt für die Weinberge und Goldminen. 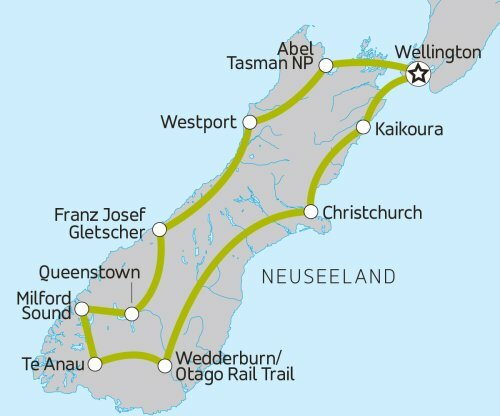 Radtour entlang der alten Bahnlinie auf dem Otago Trail von einem historischen Städtchen zum nächsten. Genieße dabei die köstlichen Spezialitäten der Region (35 km). Spaziere durch die beschauliche "Garden City". Es geht entlang der Küste nach Kaikoura, wo es die optionale Möglichkeit zur Walbeobachtung gibt. Morgens besuchen wir eine Robbenkolonie. Anschließend geht es die Küste entlang nach Picton, wo wo aus wir mit der Fähre zurück zur Nordinsel nach Wellington übersetzen. Die Unterbringung erfolgt vorwiegend in Mehrbettzimmern. Die Unterbringung im Einzelzimmer ist nicht möglich. Plane USD310-405 für nicht inbegriffene Mahlzeiten ein. Eine Fahrt mit dem Jetboot auf Queenstowns Shotover River - müssen wir noch mehr sagen? Okay, wie wäre es damit? Stell dir eine rasante Wildwasserfahrt mit Geschwindigkeiten von bis zu 85 km/h vor, sicher gesteuert von einem erstklassig ausgebildeten Bootslenker. Du musst dich nur anschnallen und bereit sein, nass zu werden. Bitte beachte, dass die angegebenen Aktivitäten und Preise nur der Orientierung dienen und sich jederzeit ändern können. Arrive at any time. There are no planned activities during the day, so check into the hotel and explore the city. The adventure begins tonight with our Welcome Meeting. Feel free to explore, but make sure you're back in time to meet the group. After introductions, your CEO will review the details of your tour. We catch a morning ferry and cross the scenic Cook Strait. Make sure to stand outside and enjoy the views of the Marlborough Sounds at the top of the South Island. Disembark and transfer to Abel Tasman National Park, well-known for its stunning white sand beaches. Board a water taxi to transfer to the middle of the National Park for the night. The night will be spent on a floating boat hostel. Note: During the winter season (May - Oct), and when there is inclement weather in the summer, we will stay in cabins in a true rural setting on the edge of the park instead of the floating boat hostel. 90-176NZD per person. Sail through crystal clear waters, admire spectacular scenery and investigate secluded cloves, small islands, golden beaches and lush forest. Don't forget to wear a hat and sunscreen! 110NZD per person. Explore the coastline and beaches in stunning Abel Tasman National Park. Kayak from Watering Cove along the coastline to Marahau. 235NZD per person. Jump, slide, rappel, swim and float down the Torrent River on this canyoning adventure. Make your way down stream and see the stunning rainforest scenery on this active adventure that will bring you into the heart of Abel Tasman National Park. Head south down the coast of black-sand beaches. Visit a seal colony and take in the pancake rock formations at Punakaiki. Visit the Cape Foulwind seal colony, then follow the stunning coastal road down to a beach camp in Punakaiki for the night. Visit the famous 'Pancake Rocks' walk upon arrival into Punakaiki. Take in the pancake rock formations at Punakaiki before continuing on to Franz Josef. Enjoy free time for optional activities like hiking, horseback riding, and quad biking. 40NZD per person. Take a scenic kayak trip up the river from Punakaiki into the National Park. Enjoy paddling along the Pororari River, there are some small rapids to keep the route exciting and great views in all directions. 459-539NZD per person. Take a once-in-a-lifetime helicopter ride high up on Franz Josef Glacier. Hop out and trek on the white and blue ice. Cool! 79NZD per person. Enjoy spectacular views on a guided interpretive walk that follows a riverbed along the Franz Josef Glacier's retreat. At the end, you'll be rewarded with a great view of the glacier off in the distance. 99-129NZD per person. Explore the stunning Lake Mapourika by kayak. This lake was created as the Franz Josef glacier retreated 14,000 years ago, and the still water has created a natural mirror allowing you to soak in the incredible panoramic views. 65-160NZD per person. Hop aboard the two-seater ATV quad and drive along ancient glacial pathways carved into the landscape by ice and water. Be amazed at what lies around every twist and turn as you are guided through rainforests, riverbeds, grasslands, sand and mud. Feel the thrill of fresh air in your face and the excitement of riding in the wild. 379-409NZD per person. The sheer size and power of Franz Josef is something you need to see to believe. Board a chopper for a leisurely flight over the glacier before landing directly on the ice. From there, get up close and personal on a three-hour guided hike past towering peaks and stunning blue ice. The constantly shifting ice flows and crevices ensure your visit will be one-of-a-kind! Free. Take your pick of many scenic and memorable treks in Franz Josef – a true hiker’s haven. Get prepared before heading out, and be mindful of signs along the track. See majestic mountains, glaciers, rivers, and amazing views that you’ll definitely want your camera on hand for. 65-150NZD per person. Hop in the saddle and explore Franz Josef’s amazing glacier landscape on horseback. Ride amid rainforests and mountain scenery, and enjoy fresh open air and natural beauty on this unforgettable trip. Visit the adventure capital of the world - Queenstown. If you have pre-booked the Queenstown Jet Boating, your tour guide will inform you when you will do the activity during your tour, as days are subject to change. Please note - in the winter months (late April - early Nov) skiing and snowboarding in the Southern Alps is a highlight for any visitor. Most of the optional activities are also available, ask your tour guide which ones are in season. 32-140.00NZD per person. Hop on a bike and get familiar with some of the great trails in the area. There are routes for all levels of cyclist to enjoy so rent a and start exploring the hills. 299-439NZD per person. Enjoy the awe-inspiring beauty of Queenstown from an eagle's perspective. Suit up, get briefed and board the prop plane to soar high about the rugged alpine landscape. Strap onto your instructor, take a breath and leap into a once-in-a-lifetime free fall. This is what a natural high truly feels like! 185-230NZD per person. Visit vineyards in New Zealand's fastest growing wine region. Taste some of Queenstown's finest Pinot Noir, as well as Riesling and Sauvignon Blanc. Sample local cheeses and learn more about the grape varietals that flourish here. Pick up a few bottles to savour back home. 175-510NZD per person. Adrenaline junkies will be happy with a stop at the world's original commercial bungee site (bungy in New Zealand!). Opt to take the plunge or simply observe where it all started from the comfort solid ground. Shoot some amazing photos of those brave enough to dive into the abyss. 35-56NZD per person. Take a ride up to the top of the mountain by cable car gondola. Get a spectacular 220º view of Coronet Peak, the Remarkables mountain range, and Lake Wakatipu below. 210NZD per person. Hang on! Get a birds-eye view of Queenstown on an exciting ride in the sky. 149NZD per person. Jet boating is a typical New Zealand activity— go as fast you can in a boat over water. Hang on tight as you fly across the surface of the water. Shoot through narrow rocky gorges and dare to watch as the driver takes hairpin turns frighteningly close to the cliffs. 165-325NZD per person. Escape New Zealand and head to Middle-earth on a horseback riding tour of sites used in the Lord of the Rings films. Take in the breathtaking views and see if you can spot places where the films were shot. 205NZD per person. Get your heart racing as you launch yourself from the world's highest canyon swing. Free fall for 60m before a 200m swing across Shotover Canyon. See you at the other side! 88NZD per person. Head underground to see the mysterious and beautiful glowworms that magically shine bright deep in limestone caves. Learn about local history, and experience an unforgettable, one-of-a-kind natural wonder. Due to cold weather during the winter months (approx June to late September), we will be going on a three hour nature cruise in Doubtful Sound instead of kayaking in the area. Lace up your hiking boots and head out on a trek to take in the amazing scenery around Te Anau. Hikes range from short walks to more challenging full-day treks - take your pick! 30NZD per person. Try your hand at throwing a curling rock and sweeping the ice at the only year-round curling facility in Australasia. The sport of curling was introduced to New Zealand in the late 19th century by Scottish settlers. Enjoy a free afternoon to explore Christchurch. Overnight in the very unique converted jail house. 170NZD per person. Hop aboard a boat and head out to the open seas to search for wild dusky dolphins. Depending on conditions, most groups have 20-40 minutes of swim time with the dolphins. 135-180NZD per person. Take a 30-minute flight and set off to search for whales, dolphins, and other marine life. On land, you'll see Maori sites, Kaikoura town and New Zealand's southern fur seals. 145NZD per person. Follow in the path of Paikea, the Maori "whale rider", and set out in search of Giant Sperm Whales as they spray and dive their way through the waters off Kaikora. Depart at any time. We highly recommend pre- or post-accommodation to fully explore this vibrant city. Die Unterkünfte auf den Erlebnisreisen in Neuseeland sind meist im Mehrbettzimmer und immer in einer tollen Lage nahe bei den Attraktionen, die deine Reise unvergesslich machen. Es teilen sich normalerweise maximal vier Reisende ein Zimmer, und die Unterkünfte sind immer typisch für die Region.